I don't often publish reviews here, but given my passion for child development you will have to excuse me and let me share this one with you because this book is absolutely brilliant. From the second I opened it I thought, 'blimey, this is good' and it just hasn't gone away. This is a book that will teach them something but not be a lecturous bore, something they will read and not even know they are being taught, and this is going to help children develop a healthy relationship with food. About where it comes from - good and bad, what you can do with it - good and bad and where it goes - good and stinky! 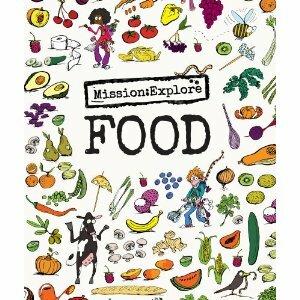 Mission:Explore Food is a seriously entertaining and engaging book. It does cover some cookery but it is not a recipe book! I mean interesting stuff like how to cook like a caveman or conduct a psychosoup traffic light experiment. It covers waste - yes, even that type, and has a toilet roll test and one of my favourites the 'where has your bum been map' where you mark on the world map all the places where you've 'deposited' a poo! This is a totally interactive book - not just a book you can write in - this has been put together by people that know the children of this generation. They understand learning in chunks, short attention spans and constant movement and interaction. Whilst I think children would sit and read it alone, this book offers opportunities for families to do stuff together with food, it's a wealth of activities on a plate. You can use it to build up your relationship together whilst helping them to build a healthy relationship for food, and in this day and age - this is a lesson children need ingrained early - before the media pressures get to them. This book has been put together by teachers, artists, therapists and explorers - The Geography Collective. I think that they knew what they were doing and it shows. So if you are starting your Christmas shopping and wondering what you are going to get them besides the plastic break it and throw under the bed stuff then here you are.